In my opinion the best hunts are with friends & family. Although I can’t always bring my friends and family with me on the road, I have met some amazing people over the years who have become good friends. 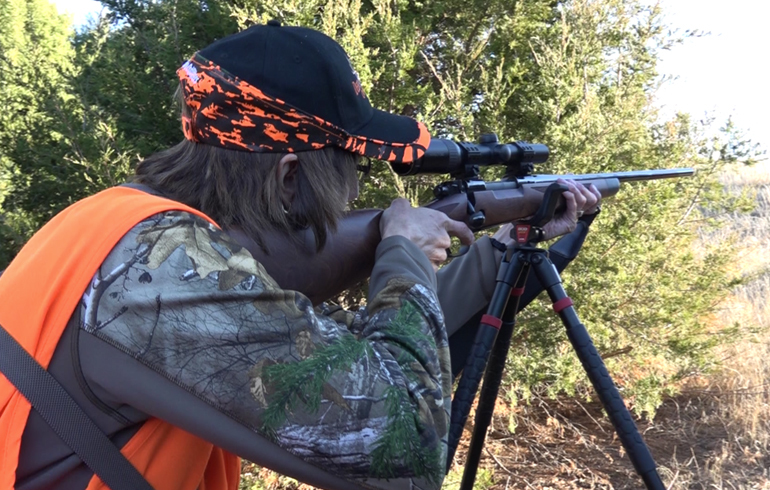 In preparation for this hunt, my mom was diligently practicing with her Winchester Model 70 .308 using Deer Season XP ammo. I decided to put a low powered scope (Swarovski Z6 1-6×24) on top of her gun. Most shots taken here are close, and the big field of view and low magnification made it easier for her to find the animal in the scope quickly. My mom grew up hunting primarily open sights and shotguns so I wanted to ensure this was as easy of a setup as possible. This was going to be a first for her on the mule deer. However, over the years growing up her and my dad made the time to take my brother and I out hunting every chance they had. They both worked during the week but the weekends were left to hunt ducks, pheasants and deer every chance we got. Most of the hunting in Minnesota that we did revolved around sitting on stand and waiting for deer to come by or by doing deer drives. 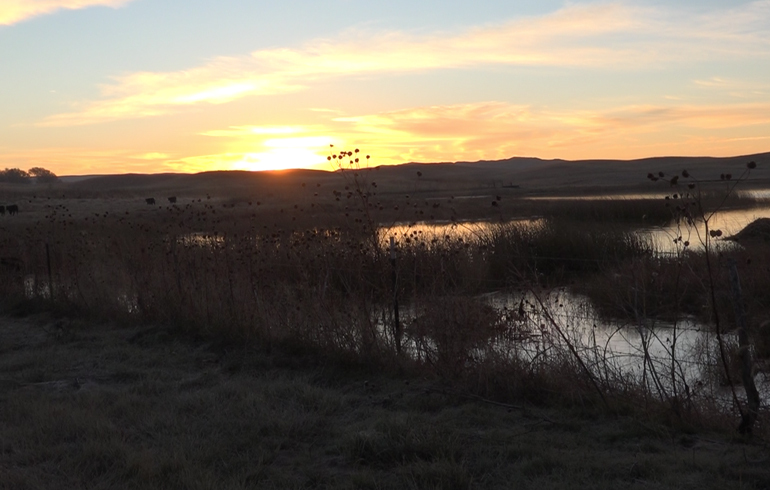 This hunt in Nebraska was going to be all spot and stalk and something completely different. In the beginning my mom really had doubts about this having any possibility of working. There were four of us (my mom, scott, myself, and Martin my cameraman) doing our best to stalk within range of a big mule deer buck and numerous does. One thing that really made this a fun hunt for both my mom and me is the number of deer we constantly see. They may be at a distance so a lot of our scouting was done through a spotting scope. It’s amazing to look at a hillside and think it’s empty until you really start breaking down the area and looking at it one section at a time. At first my mom was having a tough time spotting the deer, but by the end she was spotting them before the rest of us. 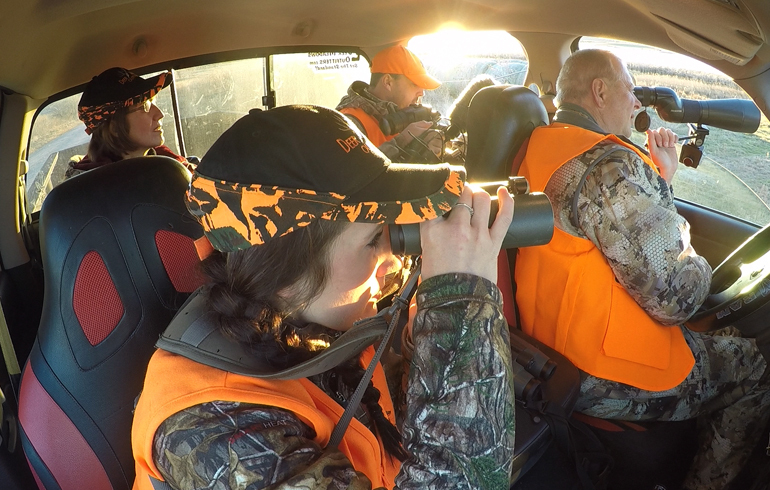 After a couple long stalks that came up short we finally made it within range of a beautiful buck and several does. I was right next to my mom filming by her side. Cameraman Martin was behind her filming as well. As we got into position the buck offered a broadside shot. 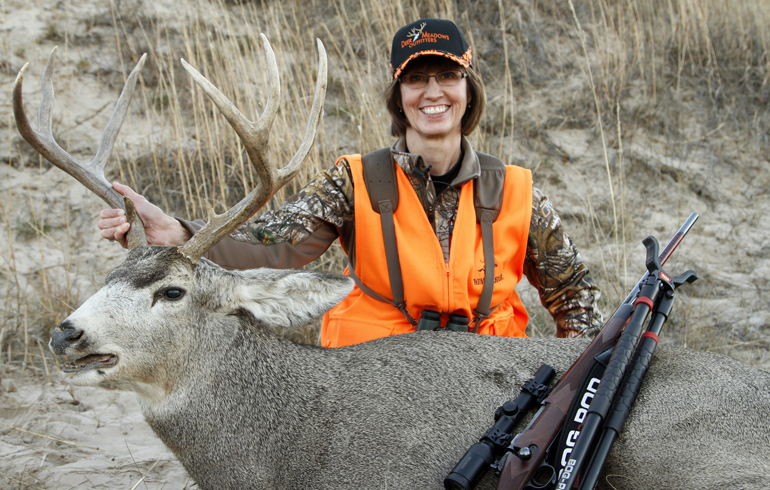 Mom steadied herself, squeezed the trigger and dropped the beautiful trophy. All our hard work, patience and dedication came together for a beautiful deer. This was not just a hunt about getting her on her first mule deer, but it took true teamwork with all of us together to make it happen. To me the hunts are all about the memories and this is one neither of us will forget anytime soon.